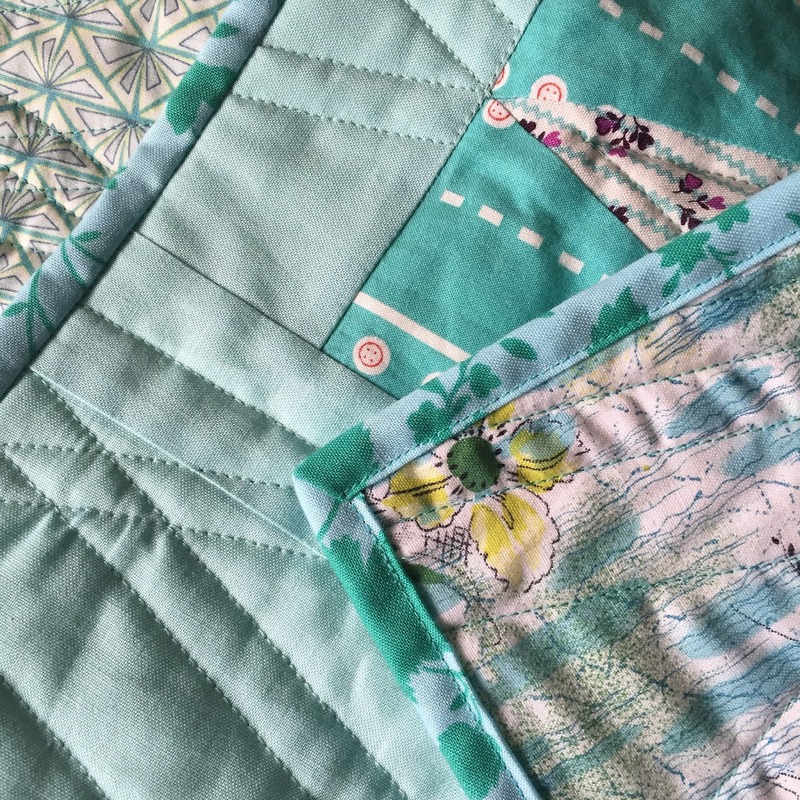 Patchwork n Play: A beautiful distraction! If I can't be sewing, at least it's for a grand reason! A grand son, in fact! because I have another 'finish' to share! I'm calling this one "All that Glitters"! and that doesn't happen very often! and I was happy with that too. Also it's ready for gifting! I wonder if Eli would like it? DETAILS: Finished size- 41" by 57"
I really like that elongated block, though I can see where it could be tedious to make. 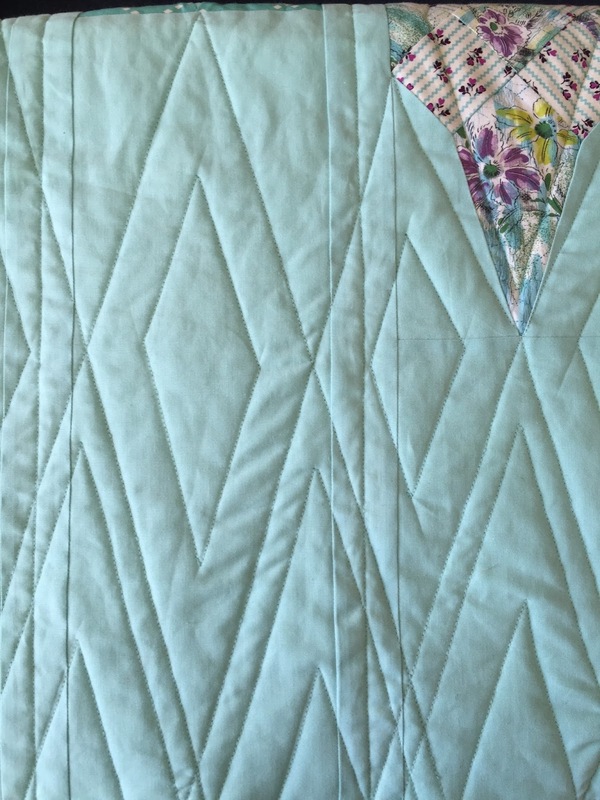 Nice quilting. I love ghosting a block in the negative space. Oh congratulations! How exciting and lovely! Eli is indeed a grand reason. I am sure he would love the quilt! Congratulations! Eli is adorable! 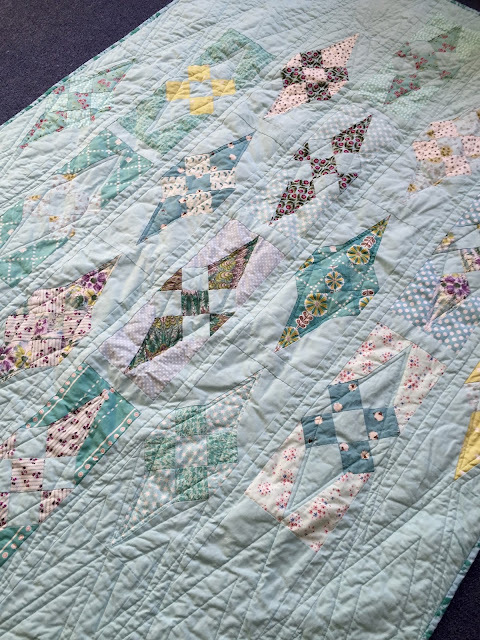 The quilt is really beautiful, I love the soft aqua colour of the background. Scrappy backs always make me smile too! Eli, how wonderful, I doubt I would be bored with more happy snaps. Sigh. All That Glitters finished up well. Very satisfying when your plans all come together for a great finish. Lovely soft colours too. Congrats- Eli is the perfect sweetie and I know you are si proud!! And I love everything about that quilt and envy your ability to see the Hera marks -- I can't see them after like a nanosecond 🤔😞. Lovely! Your grandson is adorable, congratulations!! Eli is such a cutie. What an citing time for you all. All that glitters is wonderful. I really like the quilting of diamonds and well done with the machine binding, the times I've tried it looks terrible, your edges are so neat. I'm sure Eli would love this quilt. Congratulations - Eli is so sweet! 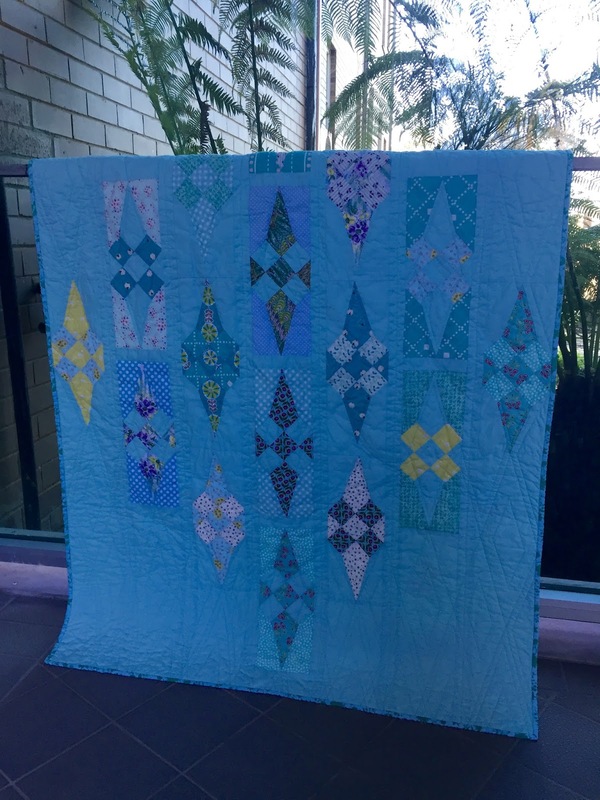 And I love how you have quilted the diamonds on your Glitter quilt - just perfect! Oh, he is so so cute! Enjoy all your cuddles, and well done on finishing a project that you weren't so excited about! 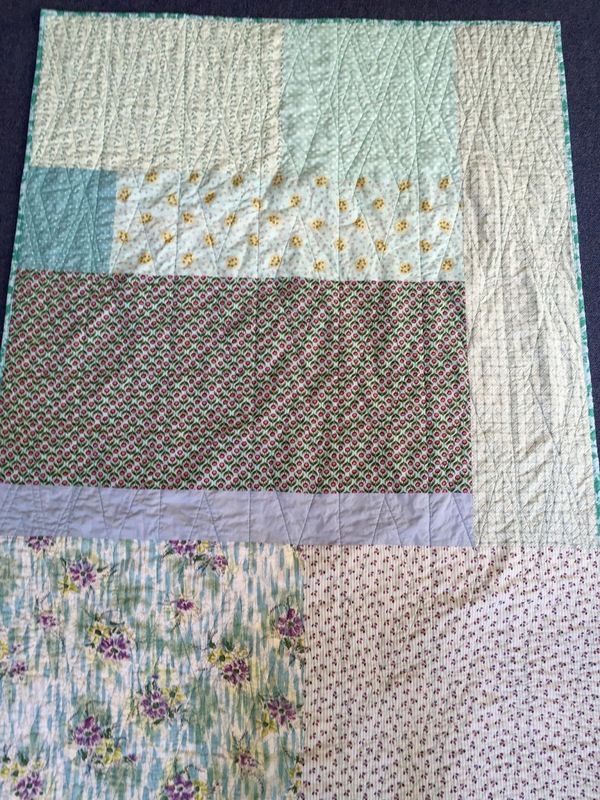 It is turned out wonderfully, and I really like the quilting especially. Congratulations, Suz! 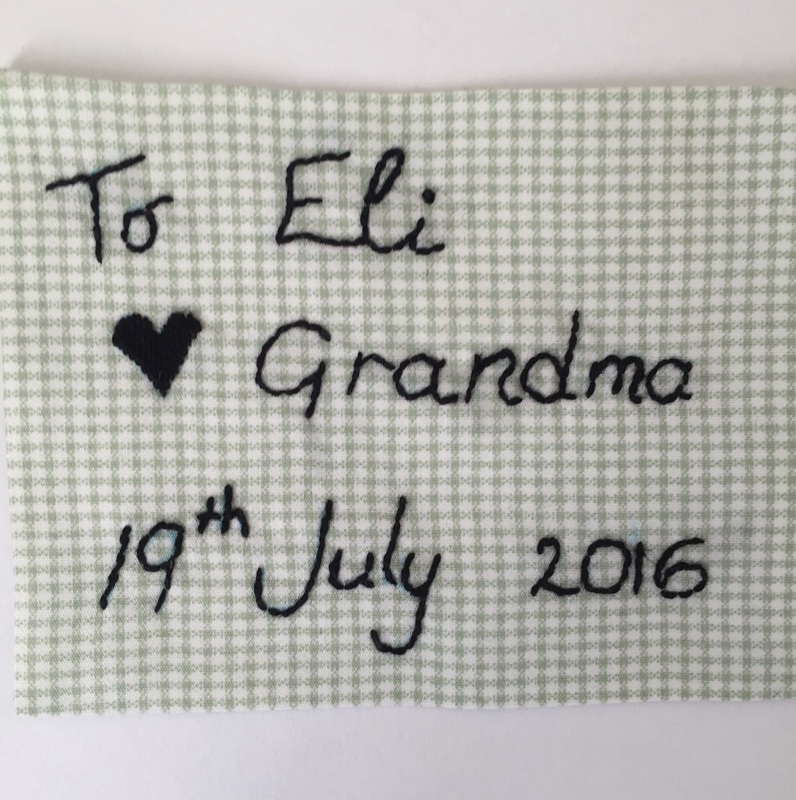 Eli is adorable and I think he will love his grandma made quilt. They make a precious pair! Congratulations, that is exciting news, and now you have the perfect excuse to buy more fabric and create more things!! Congratulations Grandma! What an exciting, wonderful time for you and your family. Eli is such a sweet baby. 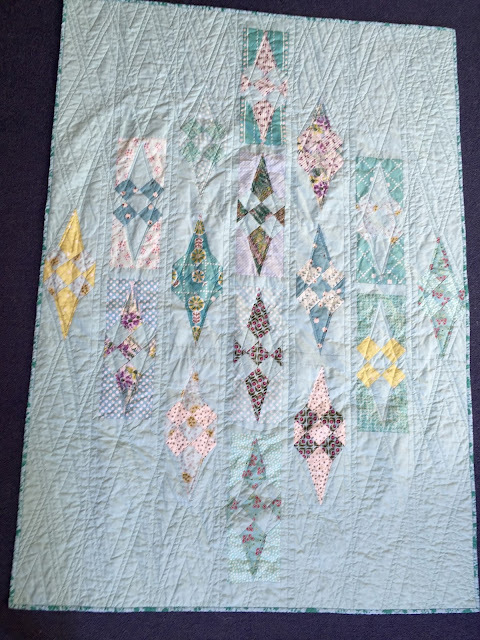 Great quilting on your Glitter quilt. Eli is so gorgeous. I am thrilled to bits for you! I think he will love his quilt. Well done with the finish. Great quilting!!! Hope you still have a big smile on your face! A beautiful baby boy! 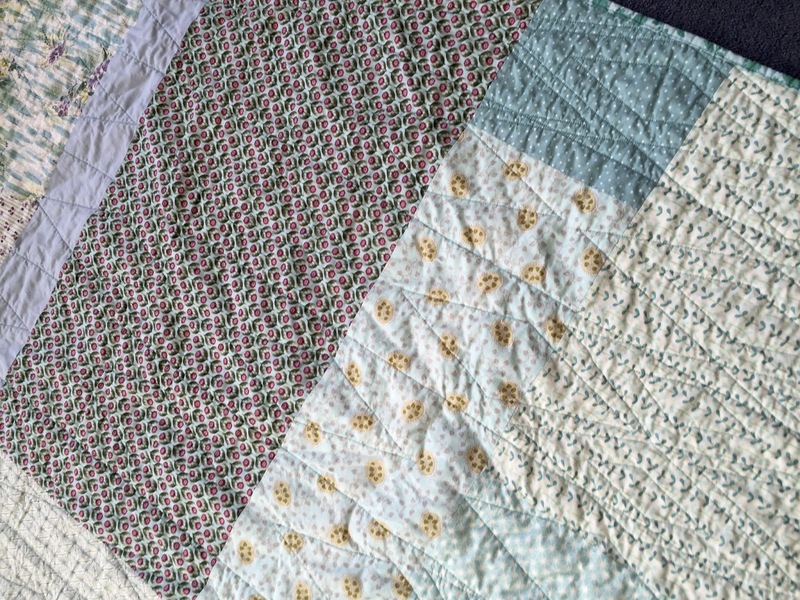 You are a lucky grandma :) The quilt is amazing, I love everything about it. I have not tried using a hera marker yet, going to have to give that a try. Awww . . . Eli is perfect. You can bore me anytime with more photos. Not that your quilts aren't beautiful too. 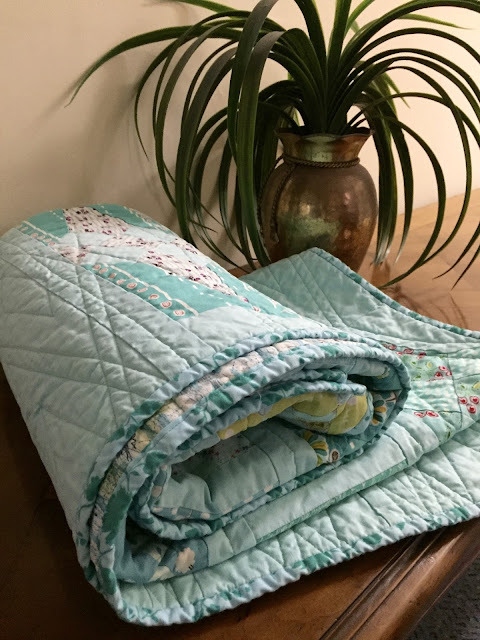 I am now officially catching up with all your posts--love the pictures of Eli, snug as a bug, and love that quilt. Man, you finish things up quickly! (and I know you were doing student teacher training at the same time). Beautiful quilt and beautiful baby--and certainly a beautiful grandma!